It might sound like science-fiction, but on Wednesday January 18th, astronomers, physicists, and scientists will convene in Tucson, Arizona, to discuss a feat that would have been considered ludicrous just a couple of years ago. They plan on taking a picture of a black hole. The conference is being organized by Dimitrios Psaltis, an associate professor of astrophysics at the University of Arizona’s Steward Observatory, and Daniel Marrone, an assistant professor of astronomy at Steward Observatory. Today’s technological means, which weren’t as advanced even 5 years ago, will give the team a chance at succeeding. The existence of black holes has been supported by observations and measurements, but it has never been possible to directly observe one. Black holes are the most extreme environment in the universe, making them eerily difficult to observe directly. The gravity field surrounding a black hole is so great that it swallows up anything within its reach. 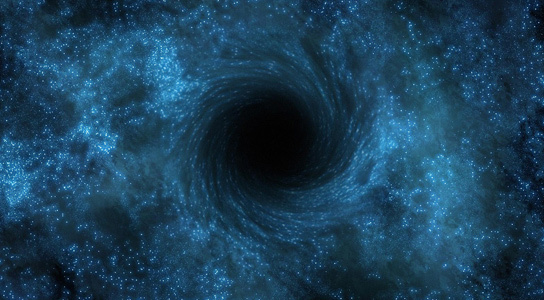 Not even light can escape, which means that black holes don’t emit any light. They blend into the void of nothingness in the background of the universe. The dust and gas that swirls around a black hole compresses into a plasma, heated to a billion degrees or more, causing it to glow and radiate energy, which is detectable. This means that the event horizon of the black hole could be observed. There is indirect evidence that there is a supermassive black hole at the center of the Milky Way, weighing one to four million times the mass of Sol, but from 26,000 light years away, it appears to be about the same size as a grapefruit on the moon. To that end, the team wants to turn 50 radio telescopes scattered around the world, including the Submillimeter Telescope on Mt. Graham in Arizona, telescopes on Mauna Kea in Hawaii and the Combined Array for Research in Millimeter-Wave Astronomy, into a giant telescope. The global array will include many radio telescopes in Europe. The virtual telescope will have a mirror the size of the Earth. Every year, they plan on adding more telescopes, gradually sharpening the image of the black hole. General Relativity predicts that the event horizon must be a perfect circle. If the shadow is oblate instead of circular, it means that Einstein’s Theory of General Relativity must be flawed in some fashion. The theory has never been tested at such field strengths before. The data will be recorded onto hard drives, which will be collected and sent to a central processing center at MIT’s Haystack Observatory. 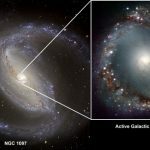 7 Comments on "Scientists Convene to Take a Picture of the Supermassive Black Hole at the Center of the Milky Way"
Can we now agree that if it is possible for something to attract light in such a way that “it cannot escape” that it has in fact already exceeded that speed! It hasn’t exceeded light speed but it has exceeded light strength. “…light strength” That’s correct because a photon has an extremely small mass. It would appear that, ‘THE BRAINWASHED DOGMATISTS’ are out in force on this one. Do you lot not realise that, the concept of, ‘Infinite Density’ was perceived and dwelt in the realms of, ‘SCIENCE FICTION’ before, Stephen Hawking magically turned it into something ‘Real’ via ‘MATH’! Are you ‘REALLY’ ‘THAT’ Gullible? By the way, Rich! Please allow me to dispel a little bit more of your ignorance, Despite what CERN claims regarding the, ‘mythical Higgs’, there is, ‘No such thing as, Mass!’ CERN have carried out so many proton collisions in the time it has been operating that, if there was such thing as a, ‘Higgs’ then it would have exerted its presence long before now. Furthermore, the type of collisions undertaken, are a recipe for, ‘Distorted Evidence’. Have you ever examined any of the results coming out of CERN? It’s ‘Demolition Derby’ gone wrong. You, sir, went full retard. Lets not insult retards please. YOU NEVER GO FULL TARD!!! !